Childish fears aren't childish to children. They are as real as any other fear of death or of pain. The thing is, when we are children we have a different perception of what it is that can harm us. For me, it was the skin that forms on your soup. My mother would have to remove it for me while I scrunched up my face, and by some rationale, covered my ears. It's funny, the things we do to hide away from evil. I was eleven when I learnt what true fear was. My best friend at the time was a boy my age, named Peter Walsh. His hair was blonde, and soft, and his face was spattered with light brown freckles in the summer. His tongue was a perpetual shade of bright green, as he loved lime cordial, and he was always surprised by things. The canteen was selling roll ups; surprised. We had homework due; surprised. The bus driver has kids of his own; surprised. When I remember him, he always has his eyebrows raised and his mouth in a perfect "o". I spent almost all of my time with Peter. His mum Judi would pick both of us up from school everyday. She was a stay at home mum and so would watch me until my mum finished work at five. We'd do some chores around the house for Judi and then she would let us play the Nintendo for half an hour, or we would go out into the backyard and pretend to be explorers. Then, if we were well behaved all week, Judi would give us a few dollars to take to the shops on Friday. Until we were ten, Peter's older brother Thomas would take us, and then after that, we were allowed to go on our own. "I should tell you," Thomas had said, "there are heaps of snakes in that paddock." To get to the shops, all you had to do was walk three houses from Peter's and then cross through an empty paddock that went all the way through the block. We never knew who owned it, but they rarely cut the grass. Sometimes it grew so tall that is came all the way up to our waists. Now when I remember Peter, I remember him carrying a tree branch, and swinging it before us. We thought that if we made enough noise that the snakes wouldn't get us. I can't remember why I wasn't there on that Friday. Maybe my mother had finished work early, as she sometimes did. But we had been good that week, and so Peter was given a few dollars to buy something at the shops. He walked down the street, three houses, and somewhere along the way picked up a stick. He entered the paddock, swinging, and never came out again. First chapter really grabbed my attention, especially the voice of the main character. I want to know what happened to Peter! Mum had woken me up with the scent of coffee that morning. Since I'd moved away for Uni, I'd rarely come home- well, actually I wouldn't call it my home. I rarely come back to our town. So, when I did, mum liked to spoil me. My mother lived her life apologising. She blamed herself for her and my father splitting up, for not having time for me in primary school, and for not being able to give me the lifestyle two parents could have. But I was never mad at her. I knew that without her I'd be an even bigger mess than I already was. When Peter went missing ten years ago, there was a gaping hole left in my consciousness. Like, a section of my mind had been removed and I needed to figure the world out again without that piece there. It was mum that told me and mum that helped me through it. She sat me down on the Sunday, after having been called by Judi on the Friday night. Have you seen Peter? Is Peter with Milla? I didn't understand what she meant by "Peter's gone". I remember asking her, "but, gone where mum?" and her replying, "no-one knows, sweetheart." School time was the worst. The other kids would ask me what I thought had happened to Peter, if I thought he'd run away or gone on a holiday. But mum was making the Walsh family dinners on the weekend, and mowing their lawn for them. I didn't know where Peter was, but I knew that they wouldn't need to be taken care of if he was on a holiday. For a time, the kids would play "find Peter", where one of the kids was Peter, one was a detective and the other kids gave them clues of where to find him. We had to have an assembly after the teachers found out. After a few months it had become boring to them anyway. Ten years on and I still remember those little things. I wrapped myself in a light dressing gown and shuffled my half-asleep body to the kitchen table, where mum and her partner of three years Stuart, sat nursing their own cups of coffee. Stuart was a non-offensive man. He was the polar opposite of my father, a man of trade with burly muscles and a crude sense of humour. Stuart spoke softly, liked cooking and owned a Shih Tzu named Molly. I didn't have much of a relationship with him, since they made it official once I'd left, but I liked him well enough and he liked me. He gave me a smile over the paper as I sat down, to which I gave a nod in return. "What do you want for breaky, Milla my sweet?" mum asked, reaching across the table and pushing my wayward hairs behind my ear. "I'll just have some cereal," I replied, forcing myself up and over to the pantry. As I poured my cereal into a bowl I could hear mum and Stuart speaking quietly behind me. I glanced at them as I grabbed the milk from the fridge, and they smiled back at me, falling silent. Stuart gave mum a "look" as I rejoined them at the table. After a seemingly telepathic communication between them, mum shifted her body to face me. "Well, we thought you might like to know that the paddock on Apsley street is being auctioned today," she said with a sad smile. I swallowed my mouthful of cereal, but it felt stuck in my throat. "The main buyers want to build some apartments there, isn't that what you heard Mary?" Stuart asked my mother, to which she gave a small nod. I felt a feeling of panic swelling within me. I recognised it immediately and new that if I didn't control it now I was at risk of having a full blown panic attack. I tensed my fingers and toes and realeased the tension, forcing them to relax. I made my way up my limbs in the same way, forcing myself to breather slow and deep. "Well," I said eventually, "that's good. Yeah, it's good. 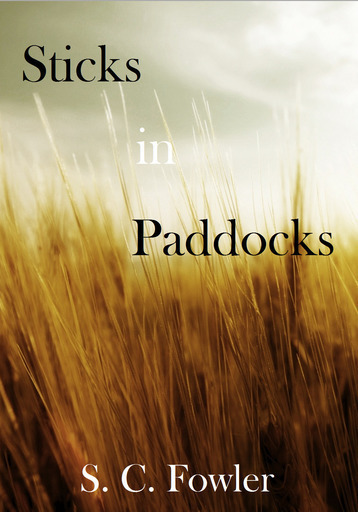 I always hated that paddock. They never cut the grass in there. Excuse me." I pushed my chair back, thought about cleaning up my cereal and then left it there before going back to bed and pulling the duvet over my head. The auction was at two. I don't know what possessed me to do so, but at 1.35 I decided to go for a run. Maybe I get some sick enjoyment from self-induced torture. It was 5.2 km from my place to Apsley street. When I got there, there was a small crowd of around thirty people gathered around a realtor. I light breeze had begun to kick up, causing leaflets in hands to protest and the women to constantly flick their hair out of their eyes. The gums that bordered the property shifted in the wind and the grass, which had been mown, rippled gently. I perched myself on a stretch of wooden fence so that I was far enough from the action, but I could still make out what was happening. The paddock was lifeless. The grass was bleached yellow from the sun, and the owner had been through and raked any large rocks or branches out of the way. It was a flat, blank slate, ready for a new beginning. The realtor began his spiel then. I couldn't quite make out what he was saying but there were a lot of mentions of "development", "dreams" and "folks". I began to realise how perverted it was that I had brought myself here. Did I want to farewell the place that my best friend had gone missing? Was I looking for some kind of closure? What was I doing at the place that I spent so long avoiding? "Good to know I'm not the only macabre one," a male voice to my left released me from my thoughts. I twisted around and was greeted by a familiar face. "Thomas!" I exclaimed. I swung my legs over the fence to join him on the other side. He had become so tall that when he embraced me in a bear like hug my feet left the ground. "I didn't know you were in town, Milla," he said, placing me back on the ground and smiling down at me. Although, the smile didn't quite make it to his eyes. He was truly a man now, at 24 years old. His shoulders had broadened, his eyes were more deeply set and his hair had turned from a light blonde to a thicker, darker colour. His square jaw was lined with a scruff, that given a week, would grow into a full beard. "Yeah, well, I've finished my exams for the semester so I figured I'd come home for a bit," I responded, "and what about you? The last time I saw you, you were 18 years old and heading off in a van with your mates looking for a higher self or something." He rolled his eyes and laughed. "Alright, I'll admit that I was a little misguided straight out of high school," he gave my arm a light shove, "you're a brave girl bringing that up, considering I know every embarrassing thing you've done since you were 5 years old." I threw my hands up in surrender, "OK, I won't bring it up again. Well, at least I've had the past, what? Six years? To embarrass myself in private." He nodded in a agreement as we turned our attention back to the auction which was beginning to gain some momentum. I shivered in the breeze, now truly cooled from my run. "It's just a paddock, huh?" I said after a few moments. "There's nothing in there," he agreed. He shifted his weight uncomfortably. "I used to come here at night, you know? I search this paddock with a fine tooth comb. I was just so sure that they must have missed something, because that's how it is in the books and movies, but there was nothing to find. There's nothing there." I looked at him, his brow furrowed and mouth set in a straight line. "Let's get out of here," I said suddenly, "I mean, I'm really cold and wouldn't mind a coffee," I said, suddenly unsure of myself. He pulled his eyes away from the auction and draped an arm around my shoulder, "I'll drive."